Circulating insulin-like growth factor I modulates mood and is a biomarker of vulnerability to stress: from mouse to man. Individual susceptibility to anxiety disorders after maladaptive responses to stress is not well understood. We now report that while exploring stress responses in mice after traumatic brain injury (TBI), a condition associated to stress susceptibility, we observed that the anxiogenic effects of either TBI or exposure to life-threatening experiences (predator) were blocked when both stressors were combined. Because TBI increases the entrance into the brain of serum insulin-like growth factor I (IGF-I), a known modulator of anxiety with a wide range of concentrations in the human population, we then determined whether circulating IGF-I is related to anxiety measures. In mice, anxiety-like responses to predator were inversely related to circulating IGF-I levels. Other indicators of mood regulation such as sensitivity to dexamethasone suppression and expression levels of blood and brain FK506 binding protein 5 (FKBP5), a co-chaperone of the glucocorticoid receptor that regulates its activity, were also associated to circulating IGF-I. Indeed, brain FKBP5 expression in mice was stimulated by IGF-I. In addition, we observed in a large human cohort (n = 2686) a significant relationship between plasma IGF-I and exposure to recent stressful life events, while FKBP5 expression in blood cells was significantly associated to plasma IGF-I levels. Collectively, these data indicate that circulating IGF-I appears to be involved in mood homeostasis across different species. Furthermore, the data in mice allow us to indicate that IGF-I may be acting at least in part by modulating FKBP5 expression. Santi A, Bot M, Aleman A, Penninx BWJH, Aleman IT. Circulating insulin-like growth factor I modulates mood and is a biomarker of vulnerability to stress: from mouse to man. Transl Psychiatry. 2018;8(1):142. Chandra V, Fetter-pruneda I, Oxley PR, et al. Social regulation of insulin signaling and the evolution of eusociality in ants. Science. 2018;361(6400):398-402. 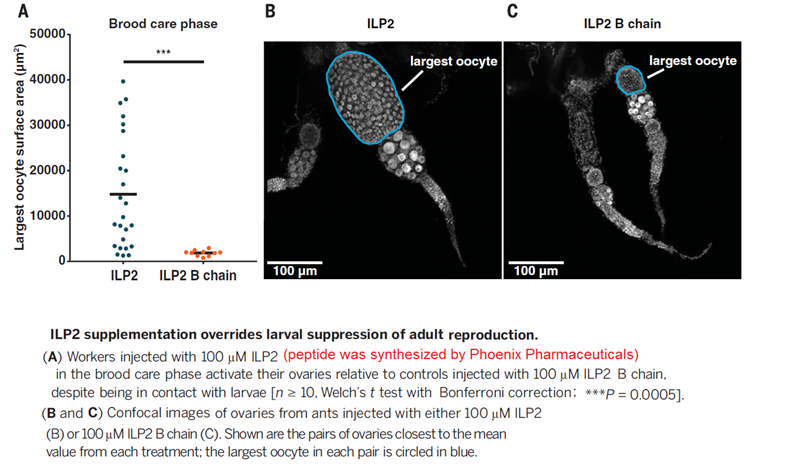 Extrinsic regulators of insulin-like peptide output in Drosophila. Schematic of an adult Drosophila, depicting extrinsic pathways that regulate insulin-like peptide (ILP) output from insulin-producing cells (IPCs). The location of IPCs in the central brain is indicated by the green box (ILP output). Neuromodulators and neuropeptide systems that modulate ILP secretion in the central brain are indicated in magenta text. Peripheral modulators of ILP secretion are indicated in blue text. 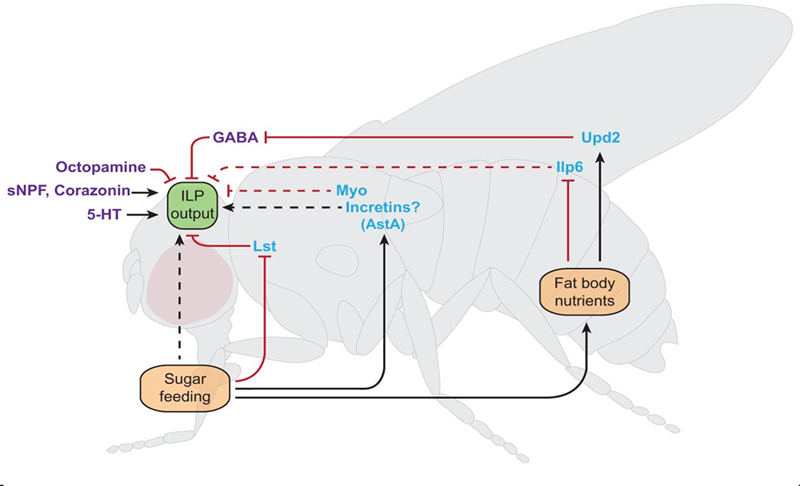 Dietary sugar controls ILP output through the CC-cell-derived decretin hormone Limostatin (Lst), the fat body nutrient sensor and through unknown direct (hatched black lines) and incretin-like mechanisms. The fat body acts as a nutrient sensor to remotely control ILP output through secreted factors Unpaired2 (Upd2) and Ilp6. The myokinin Myoglianin (Myo) is secreted from muscle tissue and mediates inhibitory control over ILP output. sNPF, short Neuropeptide F; 5-HT, serotonin neurons; AstA, Allatostatin A. Positive pathways are shown by black arrows; inhibitory pathways are shown by red lines. Limited data exists for pathways indicated by hatched lines.